Can we rely on magnetic resonance imaging when evaluating unstable atlantoaxial subluxation? Objectives: To examine whether functional radiography and functional magnetic resonance imaging (MRI) are equally efficient in detecting the extent of unstable anterior atlantoaxial subluxation (aAAS) in rheumatic patients. Methods: 23 patients with unstable aAAS (diagnosed by functional radiography) were examined by functional MRI because of a neck symptom. Twenty two patients had rheumatoid arthritis and one had juvenile idiopathic arthritis. aAAS was diagnosed if the anterior atlantoaxial diameter (AAD) was >3 mm and was considered unstable if the AAD differed by >2 mm between flexion and extension radiographs. The AAD was measured from radiographs (flexion and extension) and MRI images (flexion and neutral). Results: The extent of aAAS during flexion measured by radiography was greater than that found by MRI in all 23 patients (mean difference 3 mm (95% confidence interval 2 to 4)). In four (17%) patients flexion MRI could not demonstrate aAAS detected by radiography. The difference between the AAD measurements during flexion by these two methods was substantial (that is, ⩾4 mm) in nine (39%) cases. Severe aAAS (⩾9 mm) was seen in 15 (65%) patients by functional radiography and in four (17%) by functional MRI. Conclusions: The magnitude of aAAS was often substantially smaller when measured by functional MRI rather than by functional radiography. Thus one cannot rely on the result of functional MRI alone; functional radiographs are needed to show the size of unstable aAAS. The maximal extent of the subluxation must be taken into account when the possible compression of neural structures is evaluated by MRI. It is important to know whether the magnitude of unstable aAAS is equal when measured by functional plain radiography and by functional MRI. Is it possible to rely on the results of functional MRI alone, or is plain radiography during flexion still essential when patients with unstable rheumatoid aAAS are examined? This study sought answers to these questions. The final series comprised 23 patients; 22 fulfilled the American Rheumatism Association 1987 criteria for RA and one patient had juvenile idiopathic arthritis.7 They had had cervical spine MRI for neck symptoms. The median time interval between radiography and MRI was one month (range 0–12). The median age of the patients was 58 years (range 40–76), and the duration of the rheumatic disease at the time of the MRI was a median 31 years (range 14–46). Lateral view cervical spine radiographs were taken during flexion and extension with the patient sitting on a chair using a focus-film distance of 150 cm. MRI was performed in the supine position with the neck kept flexed by sponge supports or a neck positioning device to the extent the patient allowed. The flexion angle varied from 20° to 40°. MRI examinations were made by open field magnet (0.23 T Outlook Proview, Philips Medical Systems). In neutral position a phased array neck coil was used; a sagittal T2 weighted (fast spin echo (FSE) 4100/160 ms, 4.0/4.5 mm, field of view (FOV) 250 mm, 256×256, six averages) and a T1 weighted (FSE 340/20 ms, 4.0/45 mm, FOV 270 mm, 256×256, six averages) image set were made. In flexed position a multipurpose coil was used and either a T1 or a T2 weighted image set taken with the same parameters as before but only one or two averages to gain short (1–2 minutes) scanning time. In two cases MRI was performed on a 1.0 T General Electric Signa MR unit with an image set as above. A concordance correlation coefficient and Bland and Altman’s limits for agreement on flexed aAAS values obtained by radiography and MRI were calculated. In all 23 cases the magnitude of aAAS in flexion was greater in radiography than in MRI. In four (17%) patients flexion MRI was not able to demonstrate aAAS detected by radiography. The mean difference was 3 mm (95% confidence interval 2 to 4) (p<0.001), and Bland and Altman’s 95% limits of agreement were −0.5 to 6.2. The concordance correlation coefficient between flexed aAAS values obtained by radiography and MRI was moderate, 0.38 (95% confidence interval 0.18 to 0.56) (fig 1). In nine (39%) cases the difference between the measured values in flexion by these methods was substantial (that is, ⩾4 mm) (table 1). Severe subluxation (⩾9 mm) was detected in 15 (65%) patients by radiography and in four (17%) by MRI (fig 2). 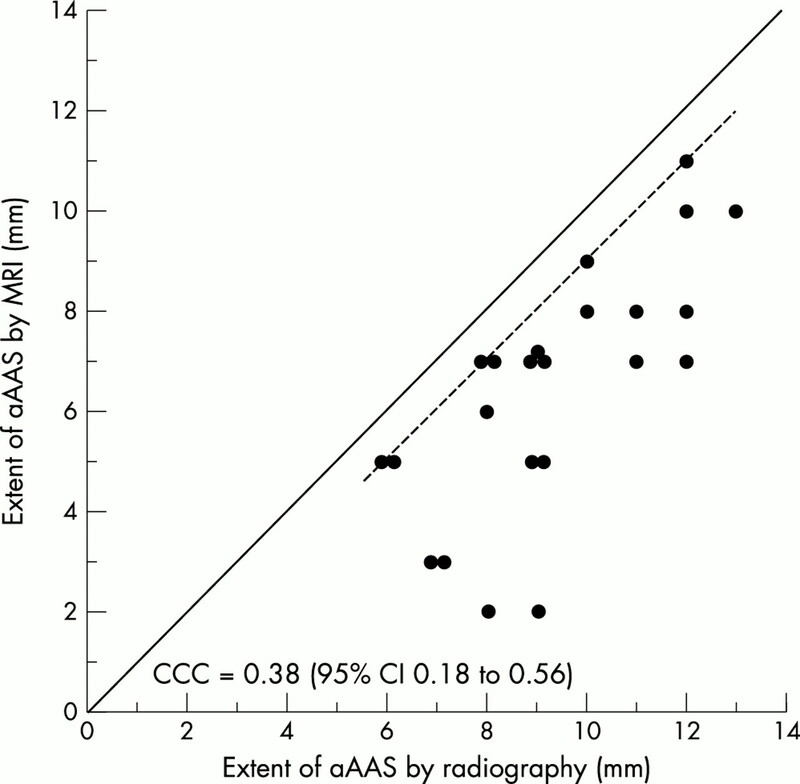 Extent of aAAS measured by radiography and MRI during flexion. Each point represents the extent of aAAS of an individual patient, measured during flexion by radiography and MRI. The solid line shows where the size of aAAS of a patient is equal in both measurements. If the 20% magnification due to radiography is taken into account the solid line should be moved to the right (shown as dotted line). MRI is often unable to show that the extent of aAAS is as large as that shown by radiography. Radiograph in flexion shows 9 mm aAAS (A) and flexed MRI 5 mm aAAS (B) in a 45 year old woman with RA for 14 years (patient No 9). In nine (39%) cases unstable aAAS (that is, ⩾2 mm difference between flexion and extension/neutral values) was shown by radiography but not by MRI. The atlantodental interval values measured in extension by radiograph and in neutral position by MRI differed ⩾2 mm in 12 (52%) patients. Radiography in extension showed three patients with pAAS whereas MRI in neutral position detected only one of them. In five (22%) patients MRI showed spinal cord contact either with the dens of axis or dorsal arch of the atlas, but no cord compression or myelopathy was seen. MRI provides a unique opportunity to visualise cervical cord compression, myelopathy, and inflammation. It has been shown that functional MRI identifies unstable AAS more often than neutral position MRI.8–10 In flexion of the neck the extent of the subluxation is usually increased and this would constitute an optimal situation to show the presence of impending cervical spinal cord compression. It was found here that in none of the 23 cases was MRI able to show the magnitude of unstable aAAS to the same extent as radiography. In 9/23 (39%) cases the size of aAAS would have been considerably underestimated if one had relied on functional MRI examination alone. Especially in cases with severe aAAS (⩾9 mm) MRI was clearly less often able to demonstrate the magnitude of subluxation to the extent seen in radiographs. Diagnosis of pAAS was made less often by MRI than by radiography because MRI was carried out with the neck in neutral position and not in extension (during which pAAS is most extensive). There are many reasons why functional radiography and functional MRI measure the extent of an aAAS differently. Radiography magnifies distances and in lateral view cervical spine the magnification depends on the width of the patient’s shoulder. When a focus-film distance of 150 cm is used and the distance between the cervical spine and the film is 25 cm, the magnification is 20%. Magnification is not accounted for in the figures in table 1. However, the main reason for the difference is probably the different position of the patient during these two examinations. Radiographs are taken when the patient is sitting and gravity pulls the head downwards when the neck is flexed, which helps the maximal extent of aAAS to be reached. In MRI the patient is in a supine position and the neck has to be positioned by sponge supports or a neck positioning device to maintain flexion in the neck.4,5 The supine position may make it difficult to attain an adequate degree of neck flexion to elicit the full extent of unstable aAAS. We have also observed that patients with severe aAAS may find the flexion position uncomfortable and are not able to hold their neck maximally flexed for the one or two minutes needed for an image set in MRI. Radiography is more comfortable because the patient has to hold his or her neck in flexion only for the brief moment required for an x ray examination. Treatment decisions on aAAS are based on a knowledge of the size of the magnitude of subluxation, symptoms, and clinical findings. It is important to detect severe unstable aAAS because it may be life threatening if not treated adequately owing to the risk of cervical spinal cord compression. Our results show that it is not wise just to rely on the result obtained by functional MRI when the extent of unstable aAAS is evaluated. Obviously, pAAS is detected less often by MRI in neutral position than by extension radiography. Though the number of subjects with pAAS was small (three patients), the results suggest that if the cervical spine is examined by MRI in neutral position, even clinically significant pAAS cases may be missed. Our view is that functional radiography will often suffice alone as a primary examination if it is only a question of establishing whether the patient has aAAS or whether an existing aAAS has enlarged but the patient is otherwise managing satisfactorily with his or her neck. Accordingly, we suggest that functional MRI should be applied when aAAS is substantial (that is, ⩾9 mm) or combined with significant atlantoaxial impaction, or the patient has symptoms or clinical findings which may indicate the presence of spinal cord compression, or a patient with RA has other severe neck symptoms of unknown cause. In conclusion, functional MRI frequently underestimated the extent of unstable aAAS when compared with results obtained by functional radiography. Functional radiography is still needed in the cervical spine examination of a patient with chronic arthritis; to diagnose and to evaluate the true severity of aAAS/pAAS. The maximal extent of subluxation must be taken into account when the possible compression of neural structures is evaluated by MRI. Sharp J, Purser DW. Spontaneous atlanto-axial dislocation in ankylosing spondylitis and rheumatoid arthritis. Ann Rheum Dis1961;20:47–77. Halla JT, Hardin JG, Vitek J, Alarcón GS. Involvement of the cervical spine in rheumatoid arthritis. Arthritis Rheum1989;32:652–9. Kauppi M, Neva MH. Sensitivity of lateral view cervical spine radiographs taken in the neutral position in atlantoaxial subluxation in rheumatic diseases. Clin Rheumatol1998;17:511–14. Allmann K-H, Uhl M, Uhrmeister P, Neumann K, von Kempis J, Langer M. Functional MR imaging of the cervical spine in patients with rheumatoid arthritis. Acta Radiol1998;39:543–6. Reynolds H, Carter SW, Murtagh FR, Rechtine GR. Cervical rheumatoid arthritis: value of flexion and extension views in imaging. Radiology1987;164:215–18. Kauppi M. A method for classification of the posterior atlanto-axial subluxation. Clin Rheumatol1994;13:492–5. Arnett FC, Edworthy SM, Bloch DA, McShane DJ, Fries JF, Cooper NS, et al. The American Rheumatism Association 1987 revised criteria for the classifcation of rheumatoid arthritis. Arthritis Rheum1988;31:315–24. Einig M, Higer HP, Meairs S, Faust-Tinnefeldt G, Kapp H. Magnetic resonance imaging of the craniocervical junction in rheumatoid arthritis: value, limitations, indication. Skeletal Radiol1990;19:341–6. Pettersson H, Larsson EM, Holtås S, Cronqvist S, Egund N, Zygmunt S, et al. MR imaging of the cervical spine in rheumatoid arthritis. Am J Neuroradiol1988;9:573–7. Reijnierse M, Breedveld FC, Kroon HM, Hansen B, Pope TL, Bloem JL. Are magnetic resonance flexion views useful in evaluating the cervical spine of patients with rheumatoid arthritis? Skeletal Radiol2000;29:85–9.